This salt is a true delicacy. It has a pungent “earthy” scent and an aromatic, lingering taste known as umami. 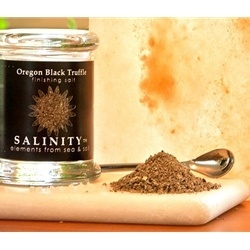 Does not have the same strong aroma and flavor as the italian truffle sea salt. We recommend tossing capellini pasta with olive oil and topping with Oregon Black Truffle finishing salt. Bon Appetite!! !